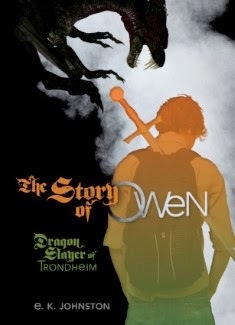 The Story of Owen: Dragon Slayer of Trondheim by E. K. Johnston. Carolrhoda Books. 2014. Library copy. Morris Finalist. The Plot: Siobhan, 16, explains how she met Owen, a dragon slayer in training, and became his bard. Oh, and did I mention -- the setting is modern day Canada? It's a world where dragons are, and always have been, real. Real, dangerous, and deadly. Being a bard is more than singing songs or writing ballads; it's becoming so close to the dragon fighter, and the dragons, that the bard can accurately portray what happens: both the actual truth, and the emotional truth. Which means Siobhan, an introverted musician, is going to have to get close to Owen...and the dragons. Which are real, dangerous, and deadly. This gets on my Favorite Books of 2014 easily, because it has so many elements I just adore. First is the alternate universe Canada, and seeing how The Story of Owen takes familiar history and culture (from Dracula to World War I) and having dragons be part of those stories. It made the dragons and Siobhan's world more real; it was fun; and it was impressive to see just how deep a backstory and world had been created. For example, the United States' "don't ask, don't tell" policy exists in this world and it means that Hannah, a talented blacksmith (and Owen's aunt by marriage, she's married to his aunt Lottie) defects to Canada. Second is the relationship between Siobhan and Owen. This is going to be a bit of a spoiler, so sorry -- but this is a story of friendship not romance. It's about Siobhan and Owen becoming friends, and about Siobhan's growing friendship with other people at her school. Before Owen comes to town, before Siobhan agrees to be his bard, all Siobhan needed was her music. Becoming Owen's bard doesn't just mean she becomes closer to Owen; she develops relationships with more people in her community. Third is that while this is a story about Owen, it's also about a society that needs dragon slayers but for reasons the book explains, the majority of dragon slayers are working in the military or being paid by corporations. They aren't local; they aren't taking care of smaller communities; and they aren't really emotionally connected to the average person. In The Story of Owen, Lottie has realized the flaws in this system and is using her nephew and Siobhan to correct it. Other reviews: The Book Smugglers; Sense and Sensibility and Stories; Quill and Quire. The themes and world-builing in this book are so ambitious and yet so well done. She wove them together beautifully. I am so excited to read the next book. I really like what she did with this and am very eager to read the next one -- the world building is so well done!